"This makes a great gift. Put pecans in mason jar and tie lid with ribbon or raffia. My family and friends love them and request them every holiday. Easy and inexpensive gift. Adjust spice to your liking." Preheat oven to 350 degrees F (175 degrees C). Line a rimmed baking sheet with aluminum foil. Pour butter over foil layer. Whisk sugar, egg whites, cinnamon, and cayenne pepper together in a large bowl. Add pecans and toss to fully coat. Spread coated pecans on the buttered baking sheet. 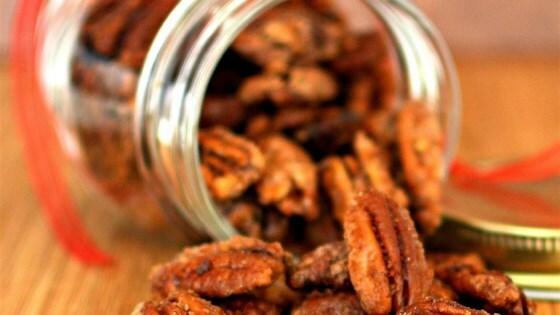 Bake in the preheated oven, stirring and flipping pecans after 10 minutes, until pecans are toasted, about 20 minutes. Cool pecans on baking sheet for 15 minutes. Make sure the pecans are tossed around on cookie sheet while baking to ensure they don't burn on one side. Careful not to break the foil. I would not change a thing. This recipe is amazing!!! I made these per the recipe and they were neither sweet or spicy. They were also rather greasy feeling from all the butter. I followed the ingredients to the letter, but cooked it for 30 minutes. I will be making this again. Followed instructions. Think next time I will bake a little longer. 30 minutes. Still delicious. I used half brown sugar and half white sugar. Needs extra cayenne for kick. Cooked 30 minutes. I made these & they REALLY good. Nest time I will add more cayenne. Not enough for my taste.